What a great idea…go be inspired. Another remarkably hazy day: our view is confined, the horizon near, no mountains; as you look off only four or five miles, you see a succession of dark wooded ridges and vales filled with mist. It is dry, hazy June weather. We are more of the earth, farther from heaven, these days. We live in a grosser element. We [are] getting deeper into the mists of earth. Even the birds sing with less vigor and vivacity. The season of hope and promise is past; already the season of small fruits has arrived. The Indians marked the midsummer as the season when berries were ripe. We are a little saddened, because we begin to see the interval between our hopes and their fulfillment. The prospect of the heavens is taken away, and we are presented with a few small berries. The number of mumps cases in Iowa has declined dramatically over the past few weeks, and an outbreak of nearly 2,000 cases appears to be contained, state public health officials said Friday. ‘People became more aware of it, people were being diagnosed faster, staying home when they had mumps so they are not transmitting it, and we had many more people get vaccinated, so our number of susceptible people went down,’ said Dr. Patricia Quinlisk, state epidemiologist. Iowa was the worst hit of 12 states, mostly in the Midwest, that have reported a total of more than 3,200 mumps cases. No deaths and few hospitalizations have been reported, but the numbers dwarf mumps reports from recent years. And everyone is worried about avian flu? Looks like it’s going to be death by childhood disease instead. I guess it doesn’t matter what specific outbreak you fall prey to, once one of these decides to mutate we will all be in trouble. The word from the authorities on the measles is that if you were born between 1957 and the late 60’s your immunization wasn’t all that effective…Oops. Maybe Fred has the better idea, a small isolated place in the country on a nice quiet gravel road…Just wear a mask when you come to visit, please. Story is really all we leave each other. Even the most precious heirlooms, including the ones I tend in my own home, will not last: someday they’ll end up in an estate sale or a house will burn down or they will simply lose meaning. What has the most lasting value is the story of who we are, who we come from, where we aspire to go. Story has a beginning, middle and end that makes a point, delivers an insight or shares an experience. This is called narrative… Narrative is how we remember, how we communicate, and how we assign meaning to events. It looks like this may be what it is that is driving all of our blogging. The need to put the narrative back into the structure of our life. Without the stories of our life, can it really be said that we have left anything of us behind? Why is there ‘no place like home’? Because I am away from home, I am wondering just what it means to feel ‘at home’. I deeply love the southern Appalachians where I live, but feel certain I could love other places as well, had the Great Gumball Machine yielded ME in another instance of place and time. I sometimes wonder, if I had grown up in some flat and featureless place (Kansas, maybe), would I have ever developed a ‘sense of place’, a feeling of belonging to a place that, upon leaving, all I would think of is how much I looked forward to returning, of standing in my own fields again? I’m talking about a relationship with the land, WHERE you live, not the people, not the city, not the community. What makes one either bond to the physical features of where they live, or not? Is it simply a matter of loving the one you’re with, geographically speaking? Growing where you’re planted? I don’t think so; at least not for me. I know whereof he speaks. I was born on the coastal plain of east Texas. Houston, Texas was the place of my birth; Pasadena, Texas was the locale of my upbringing and early adulthood. In my early teen years I was exposed to the Texas Hill Country, and it was here that I hung my dreams of moving to when I was able. Over the years I would drag the family on camping trips into different parts of this rugged portion of the State in which I was born and love. On the drive home from every trip I have ever made into the central part of Texas I began to get depressed as I would get within 100 miles of home. For a long time I could not understand why this mood would hit. Then one trip I noted where exactly I began to get moody and it was then I noticed the one glaring fact…my mood came on exactly where the hills (such as they where) played out and the coastal plains of my birth began. I began to really pay attention to the sacred places in my life (and at that time I really hadn’t seen any real mountains), and all of them were heights. Enchanted Rock, a monolithic granet dome located in central Texas, has always been a favorite. The Devils Backbone, a stretch of Texas state road west of San Marcos, is a watershed divide with some nice views in each direction from the road. The drive to Lost Maples State Park where the road plunges of the top of the plateau and gets to the bottom as fast as it can…The one commonality of all of these and many others is the overview. I have to wonder if Fred’s Goose Creek Home would be as appealing to my personality. I have never lived in a place without the wide open horizons of my native state and have to wonder at my ability to adapt in a valley…don’t know if I could handle the closed in nature of the place. I guess, as always after reading a Fred Fessay esay, I now have another thing to think about…Thanks Fred. Go on over to Fragments and add your thoughts on the subject. Colleen has a way of really saying something that just reaches out and shakes you by the shoulders and says ‘wake up, this is important.’ Thanks for the wake-up call today, Colleen. That says it all about the organizations and businesses that have managed to involve me to the point of being a walking evangelist for them. It was the story that first brought me to try them, it was the reality of their living the story that keeps me going back, and it’s the belief in the philosophy that created the story that I seem to connect with. 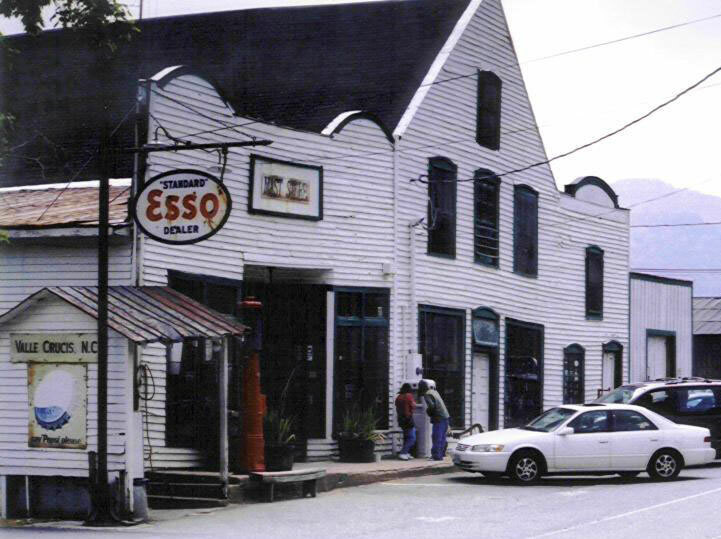 One of the very first “stories” that brought me to the area of the Blue Ridge Mountains we now call ours, was the story of the Mast General Store in Valle Crucis. I stumbled on their website and read the history long before I planned that family trip to North Carolina. It was their story that set the location for our first visit. And it was the daily stops to sit on the porch and sip a ginger beer that helped make the stay a success. During the planning for that trip, I first read the story of Grandfather Mountain and the love of one man for a “place” and the transformation that love brought to a mountain over the life of the man…which is why the recent death of a man I hadn’t ever met was like losing a member of the family. May you rest peacefully on the mountain, Hugh Morton. And it was the story behind the rescue of the Orchard at Altapass (and speaking of serendipity, as I started writing this paragraph Bill Carson’s “Story of Altapass” popped up on my computers MP3 player) that led me to make the trip to visit that institution on the side of the Blue Ridge Parkway, where Bill piled me into his vehicle to run down the road to visit the graves of the McKinney’s who first settled there. It isn’t just the stories though that makes these places special, it’s the people involved in living the stories today. And to all of you who are involved with these groups, I want to say thanks for being so very neighborly…It’s what keeps us coming back and keeps our “North Carolina Mountain Dreams” alive. p.s. Just as an explanation of what makes the fact that Bill Carson’s “Story of Altapass” playing at the exact time I was typing the paragraph about the Orchard such a coincidence, my MP3 player is set to shuffle and has a playlist that contains over 5000 pieces.